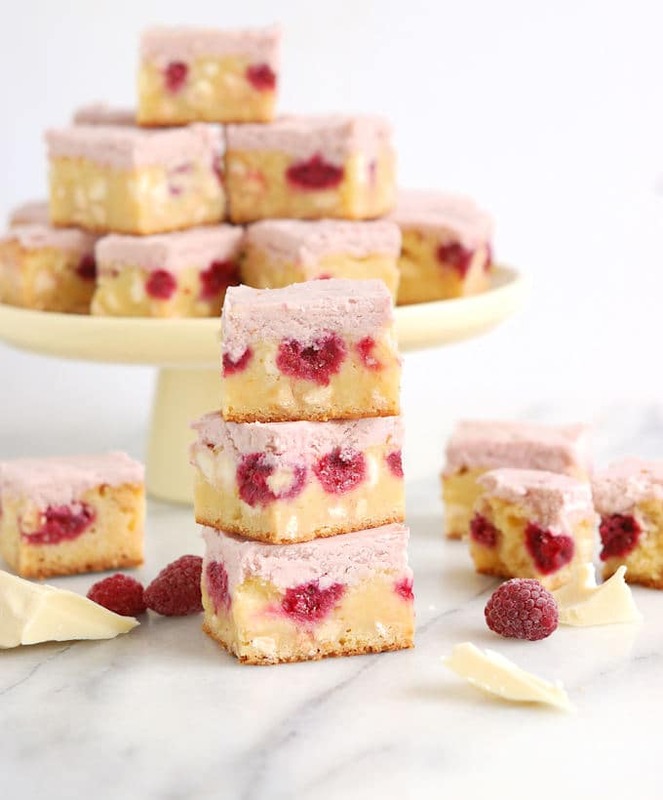 White Chocolate Brownies with raspberries are not your ordinary brownies! They might look a little fancy, but these are as easy to make as any typical brownie. I’ve said before that I’m not a huge fan of white chocolate all by itself. 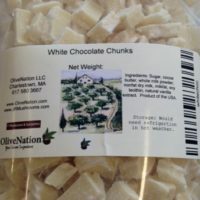 The fact is, white chocolate doesn’t contain any chocolate liquor (that’s the cocoa mass that makes chocolate, chocolate). White chocolate is made from cocoa butter, milk solids, milk fat, vanilla and sugar. But I do like white chocolate paired with a strong flavor that has some bitterness or acidity to offset the sweetness. I love white chocolate with bitter coffee, tangy citrus fruits and tart berries. One of my favorite holiday desserts is White Chocolate Cranberry Cheesecake. In that cake, tart cranberries are the perfect foil for the sweetness of white chocolate cheesecake and white chocolate ganache. 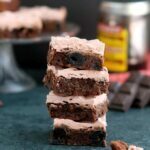 I played around with White Chocolate Brownie recipes for a couple of months trying to get just the right texture and sweetness. Because white chocolate is pretty sweet, I needed to reduce the amount of sugar in the recipe. It took some trial and error, but I finally got a brownie that had fudgy brownie texture and was not greasy or too sweet. Once I had the brownie that I liked, it was time to choose which flavor to pair with the white chocolate. I noodled around with a slew of flavor combinations. I’ll probably revisit a few that have promise for future recipes, but for this recipe I decided to use raspberries. 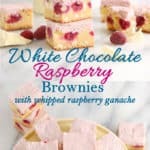 Not only do raspberries pair wonderfully with white chocolate, I knew that the bright-pink raspberries would be so pretty in the ivory brownies. Fluffy whipped-raspberry-ganache is a beautiful and tasty finish for these little lovelies. They’re pretty, aren’t they? Believe me, they taste as good as they look. 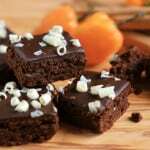 These are not your ordinary brownies! 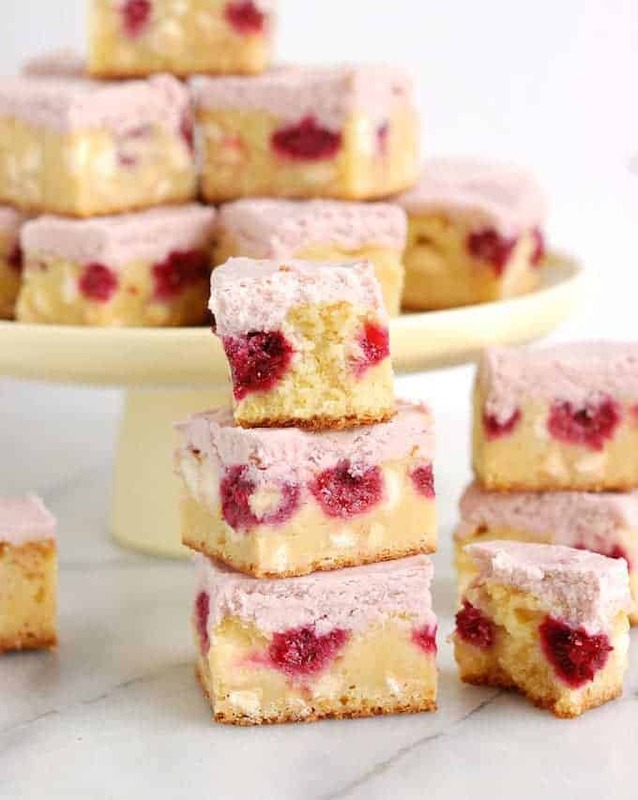 They're made with white chocolate instead of dark chocolate, they're filled with raspberries and topped with whipped white chocolate-raspberry ganache. They might look a little fancy, but these are as easy to make as any typical brownie. 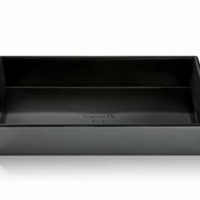 Butter a 13"x9" baking pan. Line the pan with either parchment paper or foil see how to line the pan here. Preheat the oven to 350°F. 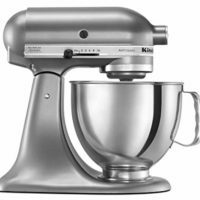 Whisk together the flour, salt, baking powder in a small bowl, set aside. Put the white chocolate and butter into a microwave safe bowl. 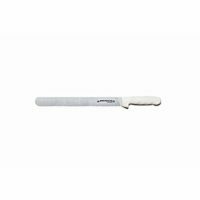 Microwave for 30 second intervals, stirring between each interval, until the white chocolate is melted. Stir the sugar into the melted chocolate, then stir in the eggs and vanilla. Add the flour and stir until it is completely incorporated. Fold in the white chocolate chips. Pour the batter into the prepared pan and smooth to an even layer. 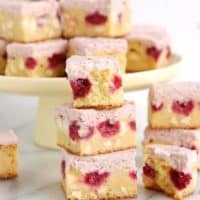 Dot the frozen raspberries all over the surface of the brownies. 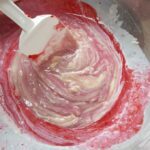 Gently push the raspberries into the batter. Bake until the brownies are golden brown and a toothpick inserted in the center has moist crumbs but not raw batter. About 50-55 minutes. Heat the heavy cream in the microwave until scalding hot. Pour the cream over the chopped white chocolate. Do not stir! While the ganache is melting, defrost the 1/2 cup frozen raspberries in the microwave just until softened. Place a sieve over the ganache. Place the defrosted raspberries into the sieve. 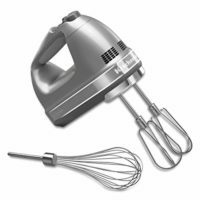 Press the raspberries with a silicone spatula so they release their juice into the ganache, leaving the seeds in the sieve. 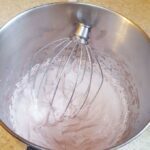 Gently stir the ganache until completely combined. If there are still bits of unmelted white chocolate, remove 1/2 cup of ganache and heat it in the microwave for 30 seconds. Add the warmed ganache back to the bowl and stir until all the white chocolate is melted. Set the ganache aside at room temperature until the brownies are cooled and ready to frost. 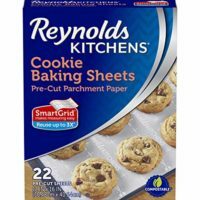 Use the parchment paper or foil lining to lift the brownies out of the pan onto a cutting board. Peel off the paper. The edges of the brownies might get pretty brown in the oven. I trimmed off the browned edges before cutting the brownies. 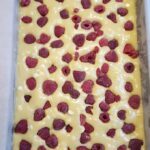 White chocolate plus raspberries!? Come to me! And you’re right, those are so very pretty. I love the light pink on top with the bursts of bright raspberries inside. These are adorable and delicious little bites of heaven! 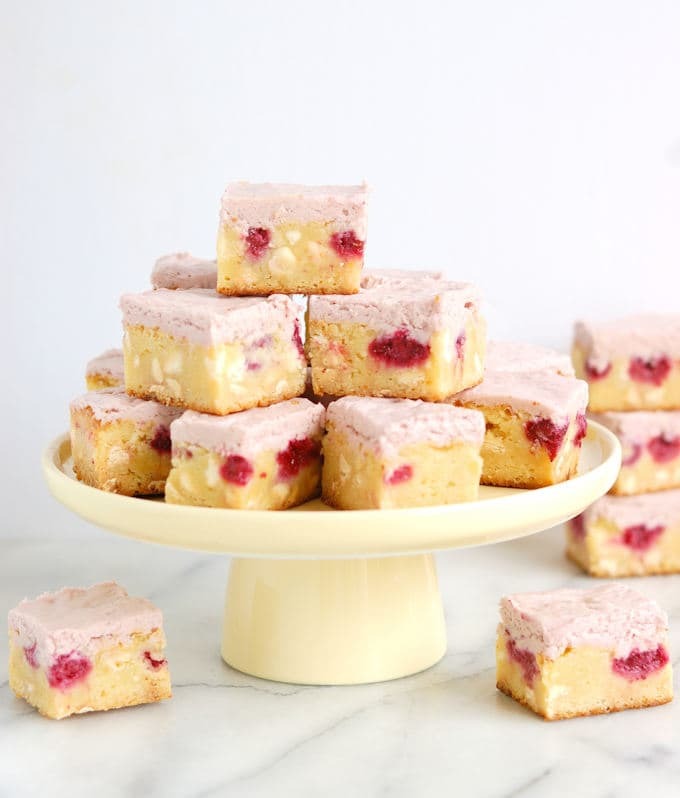 You can’t go wrong with raspberry and white chocolate! 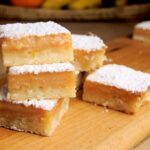 Gosh your blog is making me hungry and it’s too late to eat. I Love how cute these look. Way too pretty to eat.